No matter how you look at it the Battle of Leyte Gulf is one, if not THE greatest naval battles in the history of warfare. 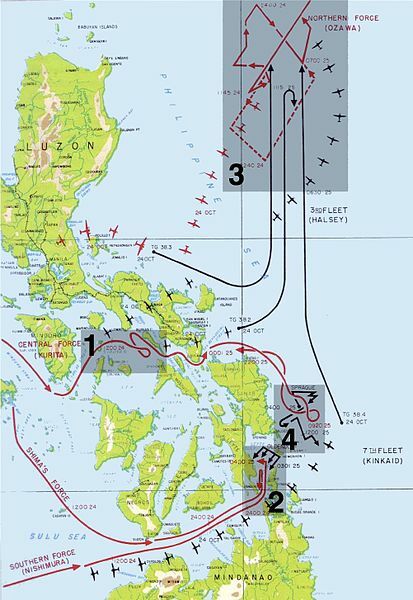 The Battle is common referred to as both the “Second Battle of the Phillippine Sea” and the “Battles for Leyte Gulf.” The battle evolved from the U.S. invasion of Leyte island on October 20th and would be fought in the waters located near the Philippine islands of Samar and Leyte from October 23rd-26th, 1944 and involve both U.S. and Australian naval forces in action against the Imperial Japanese navy. 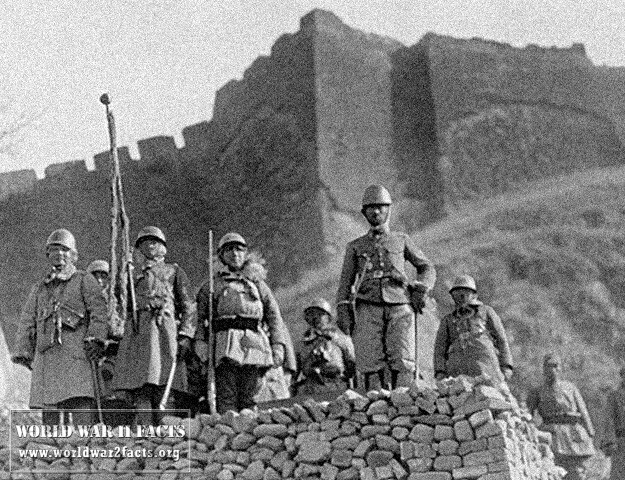 The battle would be part of the Allied Strategy of isolating Japan from the countries they had previously occupied earlier in the war in order to prevent Japanese industry and forces from obtaining vital oil and other supplies needed to carry out the war effort. USS Princeton (CVL-23) burning, but still underway, about twenty minutes after she was hit by a Japanese air attack, 24 October 1944. Photographed from USS South Dakota (BB-57). Fleet Aircraft Carrier: Zuikaku (flagship of the decoy Northern Forces). Light Aircraft Carriers: Zuihō, Chiyoda, and Chitose. Battleships: Musashi, Yamashiro, and Fusō. Heavy Cruisers: Atago, Maya, Suzuya, Chokai, Chikuma, and Mogami. Light Cruisers: Noshiro, Abukuma, Tama, and Kinu. Destroyers: Nowaki, Hayashimo, Yamagumo, Asagumo, Michishio, Akizuki, Hatsuzuki, Wakaba, and Uranami. The Battle of Leyte Gulf actually consisted of four separate battles or engagements between Allied Forces and the Imperial Navy. These included Battle of the Sibuyan Sea, the Battle of Surigao Strait, the Battle of Cape Engaño and the Battle off Samar and other naval action in the general vicinity. The series of battles that historians now label as the Battle of Leyte Gulf took place between October 23rd-26th, 1944. General Douglas MacArthur lands on Leyte Island and begins to achieve his now famous goal of liberating the Philippines. 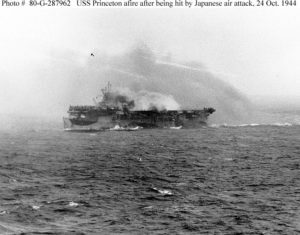 The light carrier USS Princeton explodes at 1523 on 24 October 1944 - after being bombed by a Japanese aircraft during the Battle for Leyte Gulf. The light cruiser USS Birmingham (CL-62) is visible on this side of the Princeton. Birmingham was seriously damaged in the explosion, which caused more than three hundred casualties aboard the cruiser. U.S. submarines ambush the Japanese Center Force in the Palawan Passage. Japanese aircraft attack the American Third Fleet. 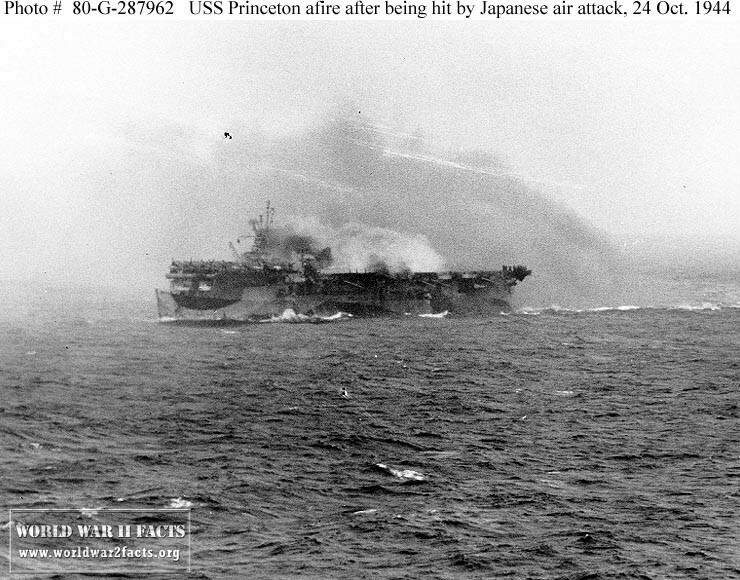 After the attack was complete, the U.S. lost the light aircraft carrier Princeton. The Battle of Surigao Strait. Would result in the U.S. Navy defeating the Japanese Southern Force. The Japanese Northern Force lures Admiral Halsey’s Task Force 38 north which would leave the San Bernardino Strait unguarded. Admiral Shima’s cruiser force fails to support the Japanese Southern Force and retreats. The Battle off Cape Engaño that would result in the Japanese Northern Force being destroyed. The tactical result of the Battle of Leyte Gulf was that the beacheads of the United States Sixth Army on Leyte Island were finally secure from Japanese attack from the sea. It would take several months of bitter land fighting; however, until the island was considered to be fully under control by the end of December 1944. Strategically, the Battle of Leyte Gulf concluded with the complete destruction of the Imperial Navy’s aircraft carriers operating under Ozawa’s Northern Force. With this destruction was the end of Japan as a naval power during World War 2. After the battle, the Imperial Navy would not meet the American navy in major action throughout the remainder of the war. 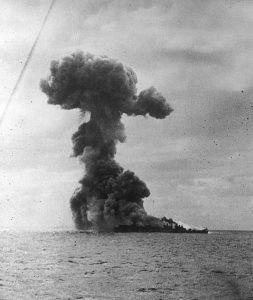 Leyte Gulf also resulted in the emergence of a new tactic to be used by the Japanese referred to as the Kamikaze (or Divine Wind) attack. Named after a major typhoon which has saved Japan from Mongol invasion during the 13th century, the Japanese would use suicide aircraft to crash into U.S. warships to inflect significant damage. The ultimate goal of the adoption of the kamikaze attack was to encourage the Americans to knock off the war and negotiate and end to it. Later in January of 1945, the Imperial Navy would launch significant Kamikaze attacks against the U.S. fleet in Lingayen Gulf after American landings on Luzon Island.